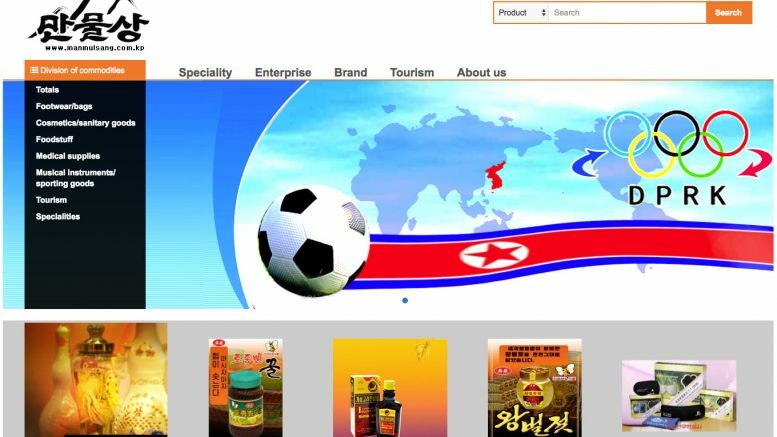 North Korea’s Yonphung Business Information Technology Centre has launched an Internet edition of its “Manmulsang” online shopping portal. A site aimed at users of the domestic intranet was launched in 2015 but the Internet site has only recently become available. Both sites use the same logo. The site introduces food stuffs and products with claimed health benefits and there are sections, currently empty, for sporting goods, musical instruments, cosmetics, footwear, bags and tourism. The site also introduces six companies: Mansudae Overseas Project Group of Companies; Samilpho Trading Company; Unha Mineral Water Trading Company; Korean Kaesong Koryo Insam Trading Company; The Kumgangsan Special Zone for International Tour; and the Meari Shooting Gallery in Pyongyang. While various goods and companies are profiled, direct e-commerce isn’t available for consumers. Contact phone numbers and email addresses for the companies are listed. The company behind the Manmulsang sites also operates an electronic payment system under the same name and offered some interesting details about its expansion. It said the system works on computers and mobile phones and will be integrated into North Korea’s national payment settlement system thus expanding its compatibility with other Korean bank cards. 1 Comment on "Manmulsang website appears on the Internet"
During my last visit to DPRK (September 2018), our guide showed me the Manmulsang app on his mobile phone. It is a full online shopping portal, with online payment and options for delivery.